Was a family member seriously injured in an auto accident? Did you suffer injuries when another driver struck your car or caused you to get into an accident? It seems that car accidents happen all the time in California. Unfortunately, many of those accidents are quite serious. Some lead to soaring medical expenses, missed work, complicated insurance issues and interference with normal life. If you were injured due to the fault of another, a qualified Sacramento car accident attorney at Rosenthal & Kreeger, LLP will do what is necessary to protect your rights to compensation. For over 25 years, our legal team has provided skilled legal representation to clients who were seriously injured in motor vehicle accidents. We will help ease your burden and reduce your stress by handling the details of your personal injury claim so you can focus on what is important — recovering from your injuries and putting your life back together. Why Hire Rosenthal & Kreeger, LLP for Your Car Accident Case? Are willing and able to take on big corporations and insurance companies to win tough cases for our clients. Have a 99 percent success rate for our cases, whether it be through settlement, mediation, or trial. Get to know our clients on a personal level. We never lose sight that we’re fighting for their rights and dignity. Your personal injury claim doesn’t deserve just any legal representation – it deserves the best. Trust the Sacramento car accident attorneys at Rosenthal & Kreeger, LLP to handle your claim so that you can focus on recovery. Call (916) 774-7200 to schedule a free consultation. Medical bills. You can recover financial damages for any medical bills due to your injuries. If you have potential future medical bills, you can recover those damages as well. Lost wages. If your accident causes you to miss work or work reduced hours, you can recover both past and future lost wages. Pain and suffering. This category of damages refers to numerous non-financial damages. It can include both physical and emotional pain. Punitive damages. In some cases, a court may award punitive damages. These damages are rare and only come about if the liable party’s actions that led to the accident were especially horrendous. The other party’s insurance company will likely give you an offer for settlement, but the amount isn’t always full and fair compensation. Working with a skilled Sacramento car accident attorney can help you properly calculate and win your damages. You should know your legal rights and options as an accident victim so you can make appropriate and timely decisions about your case. An immediate investigation can help document and preserve evidence that is critical for the case, even when the other driver was clearly to blame. A knowledgeable car accident lawyer knows how to obtain information that is important to your case and will help you meet the short legal deadlines to protect your rights. Insurance companies do not have your best interests in mind – although they may say they do. Even your own auto insurance carrier will try to pay you as little as possible for your claim. It is important to have someone with experience guide you through the claim process and explain your options, your rights, and your entitlement to compensation. If you or somebody you love was injured in a car accident caused by a negligent driver, look no further than the Sacramento accident attorneys at Rosenthal & Kreeger, LLP. How Much Do Car Accident Lawyers Charge? While hiring a lawyer is the best chance you have at recovering compensation, the potential cost may make people hesitate. After all, victims of car accidents often have substantial medical bills to handle, and they don’t want to add another financial concern to their lists. At Rosenthal & Kreeger, LLP, we work all our cases on a contingency basis, meaning no upfront fees – you only pay us when we earn your case a successful outcome. Initial consultations are free and no-obligation, letting you learn your legal rights with financial peace of mind. And if you can’t travel to our office, we can arrange a ride to and from your consultation, also free of charge. Aside from following the law, having liability coverage is important in car accident claims. Without insurance, the at-fault driver may be personally responsible for paying any damages to the plaintiff. Because of the potentially lasting impact of car accident injuries, the final damage amount may be more than an uninsured driver can handle. However, even injured drivers need to hold liability insurance coverage. California law places a cap on the amount of non-economic damages (such as pain and suffering) that uninsured drivers can recover. Even when you aren’t at fault for the accident, not holding the appropriate level of insurance can reduce your total compensation amount. Many injuries from car accidents can have lasting impacts on victims, some with even lifelong physical and emotional consequences. For these damages, you have a right to recover both past and future financial and non-financial damages. The Sacramento car accident lawyers at Rosenthal & Kreeger, LLP can help you accurately determine your rightful compensation for your injuries. The driver had a duty of care towards you. In car accidents, all motorists automatically assume a duty of care to follow the laws of the road for others’ safety. This includes pedestrians, bicyclists, motorcyclists, and other motorists. The driver breached this duty of care by acting negligently or recklessly. Any violations of traffic laws, improper vehicle maintenance, and distracted driving can all constitute negligence. The negligence act caused your accident. The accident led to your injuries. If you had suffered any injuries before the accident, you would not be able to recover compensation for those damages in your claim. While establishing duty of care can be straightforward, proving the other critical components of fault can become a complex matter. At Rosenthal & Kreeger, LLP, our Sacramento car accident lawyers have the resources to investigate your accident for evidence to establish liability. These roads and intersections have accounted for numerous accidents and injuries over the past few years. Following safe practices while driving through these areas and staying alert for what other drivers are doing can help you reduce your chances of being in an accident. According to the Safe Transportation Research and Education Center at the University of California, Berkeley, there were a total of 59,048 vehicle collisions between 2010 and 2017. These collisions have taken the lives of 1,058 people and injured 83,906 others. 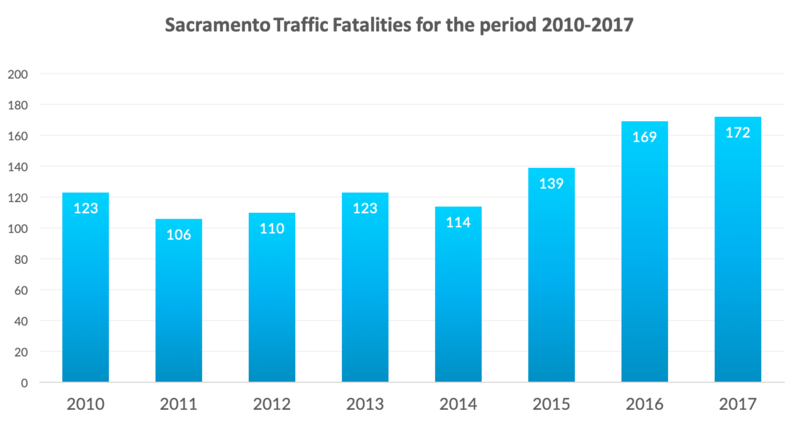 Sacramento is considered one of the hotspots for fatal crashes in the country, this is why the Personal Injury Attorneys at Rosenthal & Kreeger take this issue very seriously. To further understand the reasons behind the high number of traffic accidents, we started by looking at the collision factors responsible for the most crashes. 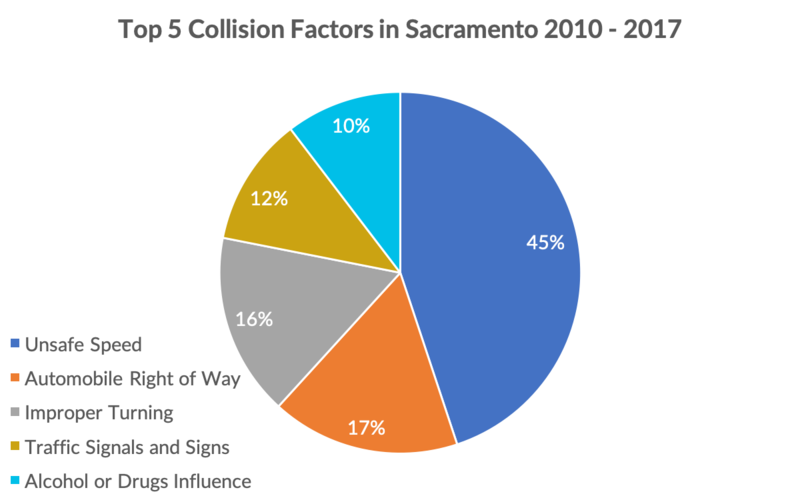 We can see that driving at unsafe/illegal speeds causes the majority of car collisions in Sacramento with 45%. Followed by Automobile right of way (17%), Improper turning (16%), Traffic Signals & Signs (12%), and finally, the influence of Alcohol and Drugs (10%). Next, we looked at collisions and injuries statistics by year. 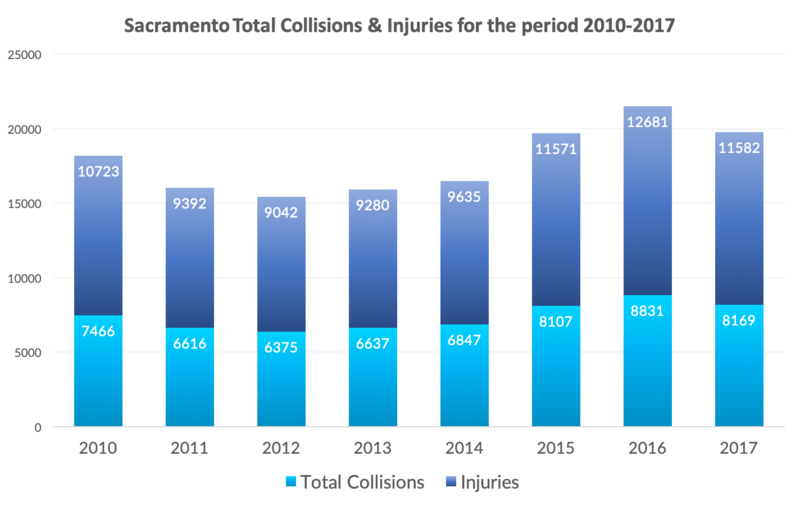 The year 2016 recorded the highest number of collisions and injuries in Sacramento with 12,681 injuries from 8,831 collisions. It was the peak of an uptrend that started around 2012. The year 2017 saw a decline in the trend with 11,582 injuries from 8,169 collisions. Although the number of collisions and injuries started declining in 2017, the number of fatalities rose by 3 for a total of 172 car collision fatalities. Finally, we looked at the roles of the collision victims to have a better sense of the data. 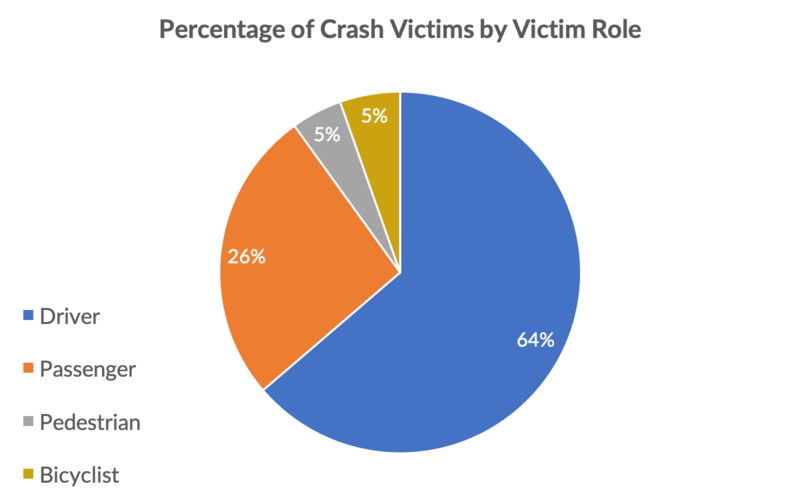 Unsurprisingly, the highest percentage of crash victims were the drivers of the automobile with 64%. Followed by passengers (26%), with Pedestrians & Bicyclists splitting the remaining 10%. For over 25 years, the legal team at Rosenthal & Kreeger, LLP has handled complex serious injury cases, including auto accidents, truck and big-rig accidents, commercial vehicle accidents, motorcycle accidents, bicycle accidents, pedestrian accidents, boat and personal watercraft accidents, and ATV accidents. Some of our vehicle cases also involve product liability, such as defective vehicle design or a flawed road design that creates a dangerous condition on public property. Our lawyers know how to investigate any accident to fully evaluate and protect your rights. At Rosenthal & Kreeger, LLP, many of our clients who have suffered serious injury have a long road to recovery that requires full-time focus and dedication. We want to take the burden of dealing with the legal issues off of your plate. We want you to focus on getting well and getting your life back together. Call us at (916) 774-7200 or contact us online to schedule your free consultation at our Roseville or Sacramento offices. There are no risks involved in discussing your options and you pay no fees until we win your case.